In 1667, the French “Sun King” Louis XIV was at war with the Spanish Kingdom, which at the time controlled the Spanish Netherlands, including Flanders. King Louis XIV led his army of 35,000 men to capture the Flemish city of Lille, and after a siege that lasted 17 days, the city surrendered to the French. Under French rule, large fortified walls were built to defend the city. Several gates were built through the old city walls, but the most notable was the Porte de Paris (Paris Gate), a giant, grandiose triumphal arch that towered over a small opening with a drawbridge. 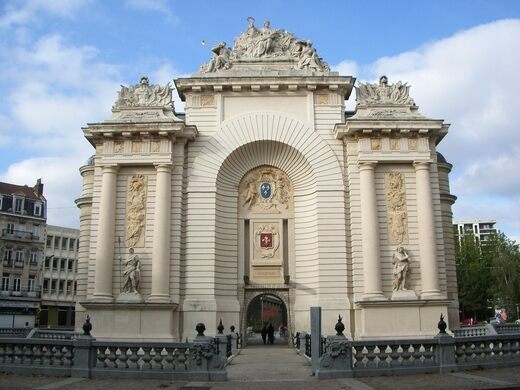 This monumental gate was built between 1685 and 1692 by a renowned architect of the time, Simon Vollant, to celebrate the glory of the king’s victory. 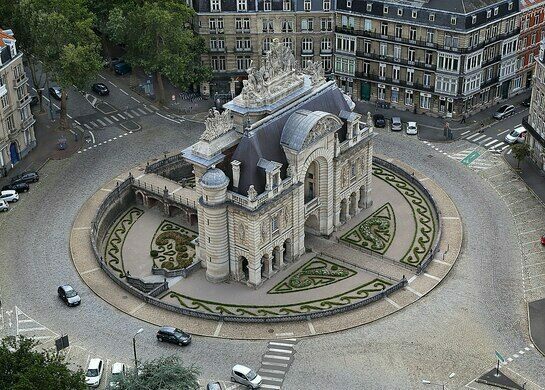 Today the structure is considered one of the masterpieces of military architecture, designed with all the pomp of the notoriously lavish French court of Versailles. At the top of the arch are the baroque figures of two angels ringing the victory of Louis XIV. To the left is a sculpture of Mars, the god of war, and on the right is Hercules, the symbol of strength. At the center, the Roman allegory of Victory is depicted with his right arm raised, ready to deposit a crown on the head of the Sun King. Though the old city walls are gone, the Porte de Paris was preserved as a historic monument and now stands tall in the middle of Place Simon Vollant, a floating gate leading nowhere. This beautifully designed star-shaped fort was the premier defense system of the late 1500s.